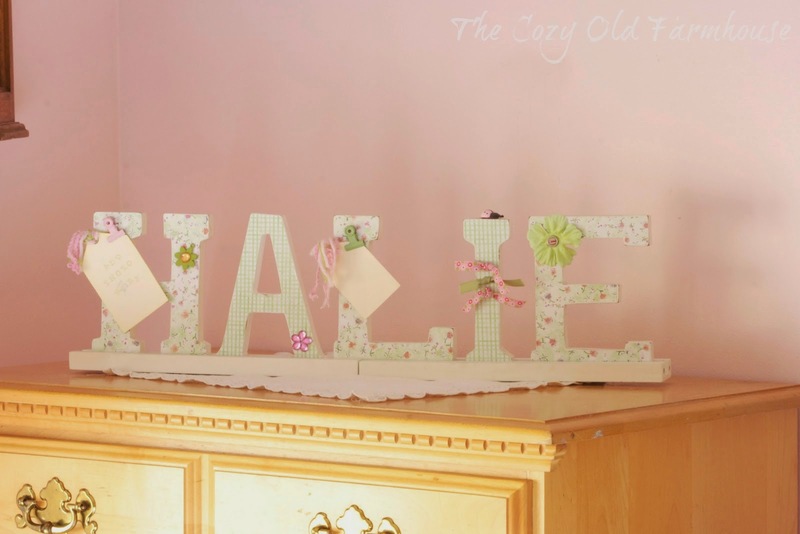 There were some pink and white wooden letters that spelled Megan's name hanging on the wall of her room. I didn't put them back on the wall when I updated her room but hung on to them. I wanted to keep them but I wasn't sure what to do with them. I saw this picture on another blog and was inspired. I painted the letters with leftover purple paint. I purchased some scrapbook paper that just happened to be on clearance. Yes! 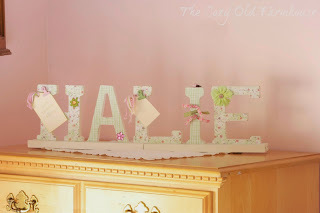 Using spray adhesive I mounted the scrapbook letters to the wood and then used an exacto knife to trim them to size. I painted a piece of wood from Chuck's scrap bucket using the same gray as the room walls. This is the piece to mount the letters onto. They were attached using hot glue. This sits on the back of her desk. I love the way it turned out! This was a frugal makeover as other then time it cost under $2.00. Bonus is that I have enough scrapbook paper leftover for another craft project already in the works. I have been weary. Oh so weary. To the point where I have been going through the motions. I can't put into words what the issue is. Truly I don't know. My life is good and when I think about how I could be weary when I am so blessed it makes it worse. I wonder how I can struggle when all my needs are met. I have a loving husband, the daughter I prayed so long for, a nice place to live, food, clothing. You get the picture. I have been tired, had a lack of energy and feel like life has been passing me by. There have been request for outings, request for meals for new babies and I have let it all pass me by. I hate that I couldn't step up, but I didn't feel like I could not take on one more thing. Sigh. Fast forward to Friday... I wasn't sure I could do it. You know, fake it till you make it. I was drained. I had a headache, four kids to care for and an outing planned. I felt like crying, but instead I prayed. I called out to my Savior and layed it all out. I am thankful that He not only listens to my cries but answers them. As I write this it is almost three. I am watching the baby sleep and the big kids playing. I felt like crying again. This time tears of thankfulness. My Lord has taken my burden, my weariness, and given me a day filled with delight. I was brave and not only took the kids to a Silly Safari program but also inside Chick-fil-A for lunch. The kids were well behaved, funny and loving. They told me mutliply times they love me and someone gave me a heartfelt compliment. I am still weary but I feel like my spirit is being renewed. I had no I idea that rice could be made in the slow cooker. I wish I had known about this little gem a long time ago! I used a 1 lb bag of rice, 6 cups of water, 2 cups of chicken broth (optional as you could use water only), 1/2 cup diced carrots (again optional). Throw it all into the slower cooker and cook 2 hours for white and 4 hours for brown rice. Unfortunately I let mine cook a little bit too long. Oops! It is still good, just changed the texture a little. I served it as a side with grilled chicken and green beans. Then I divided up the rest and put it into the freezer. I foresee adding cream of chicken, maybe broccoli and cheese. Really the possibilities are endless. We have never had a new grill. We had one from a garage sale and then Chuck took a broken grill my parents had replaced and was able to repair it. Last year it needed new burners due to one side cooking really hot. The ignitor also didn't work so we would light it with a lighter. No biggie as it still met our needs. Over the weekend the grill would not start. Chuck thought the tank was empty. No not it. New tank and he still couldn't get it to light. That is when he introduced me to BER. We purchased an inexpensive grill... well inexpensive as far as grills are concerned. That was meant to be our big purchase, but unfortunately it was not. A couple of weeks ago the washer threw the breaker. When I turned it back on the washer would not start. It was making the same humming sound when Chuck tried to start it. He left it and came in for dinner. When he returned it started. It worked but there were times when it did not spin well. I would just run the cycle again. We decided to run it until it died. Fast forward to this week and the dryer stopped working. It had been purchased used and we have had it for several years. Again Chuck said it was BER. Since the washer was on its last leg it was decided that a new set would be purchased. We did upgrade to an HE model. It wasn't much more then the traditional washer with an agitator. The savings on electricity and water should make up the difference. I have washed three loads and so far I am pleased. Although we are not happy about all we have spent we are grateful. Grateful that we had the cash to pay for these. Grateful that Chuck could use his Veteran status to save on the purchase. We are looking forward to using these items for many, many years to come. Welcome to Megan's "new" room! It is painted a wonderful shade of gray. Depending on the light it tends to look lavender or a twinge of blue. I would share the color name, but I wasn't pleased with my first choice and mixed some black and white in until I acheived my desired color. Before we step inside lets take a look at the before and after. I am going to admit that once I started painting over the pink stripes I might have gotten a little teary eyed. :) I painted the room and added a border that matched the crib set while we were waiting for Megan. Gulp... almost eight years ago! It was time for a change. As you know we do things around here on a tight budget. I had been planning this for the last year. Buying a couple things here and there plus adding things to her Christmas list. Enough talk... lets go take a peek! The bedding and the cork M are items that were on the Christmas list. Our home is not large and I wanted things to feel light and airy. I went for something light and fresh for the window treatment. I also like the fact that as Megan grows these are netural enough that they will grow with her. This is my favorite grouping. I have sang You Are My Sunshine since Megan was a baby. It is something that she will still request. As soon as I saw this print on FB I knew I had to print it! This is also a favorite. This frame held a picture of ladybugs that previously hung on Megan's wall. I removed the print and added a chalkboard. Megan wrote out the Bible verse she is memorizing for the week. The desk is the only new piece of furniture. It is something that we wanted to add for a long time. 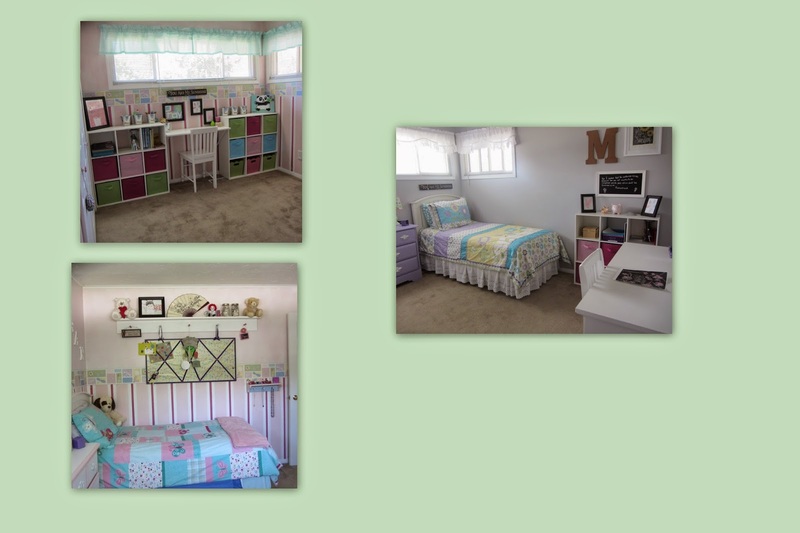 It is one of the things Megan loves most about her room. The bulletin board was previously in her room. I painted it and then covered the cork with wrapping paper and glued on a ribbon to cover the edge of the wrapping paper. The shelf above the desk was cleared off and many items did not return. Again going for simple. One end holds shells collected from our vacation to the beach and a boat the Megan made from a kit. When our neighbor passed away Celia left Megan a piece of rose quarts and a small bird. Things that she would play with while visiting. These pictures were from her nursery. The colors went well and the flowers and butterflies are more little girl then baby. This is one of the new items. The dresser is the original $5 dresser that was purchased at a garage sell. A fresh coat of paint was added. The print above the dresser was printed from Pinterest and put in an existing frame and the Pray picture is something that was made in Sunday School. This lamp is new. I added some color to the white shade by using the same wrapping paper and ribbon used on the bulletin board. This was made by a high school friend of mine when Megan was a baby. A couple days after the room was finished I went in to kiss Megan goodnight. In her sleepy slumber she whispered "I am pleased with my room." Aww... I am so happy for you Megan! I hope you enjoyed the tour. Have a great week! The day started out with dense fog. By the afternoon the sun was shining and the day was warming up. Other then a few patches of snow the feeling of Spring is in the air. It has been such a nice day that everyone wants to be out enjoying it. I know that Spring takes it sweet time coming to life around here. I am thankful for this beautiful day!